I visited this petroglyph site along the Colorado River near Moab just before sunset after a long day of exploring ruins and rock art. The low angle of the sun seemed to strike this panel perfectly giving off a nice orange glow. The most prominent part of this panel that stands out the most to me is the vertical line of tracks that seem to travel down the smooth sandstone surface. 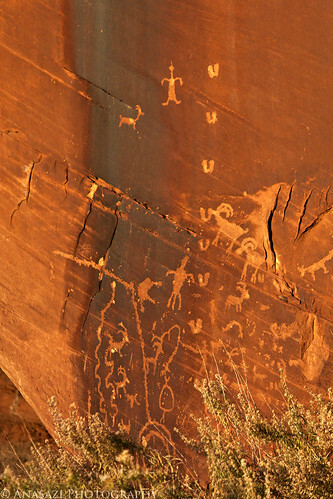 There are also your typical bighorn sheep petroglyphs and some snake-like figures on the lower left.